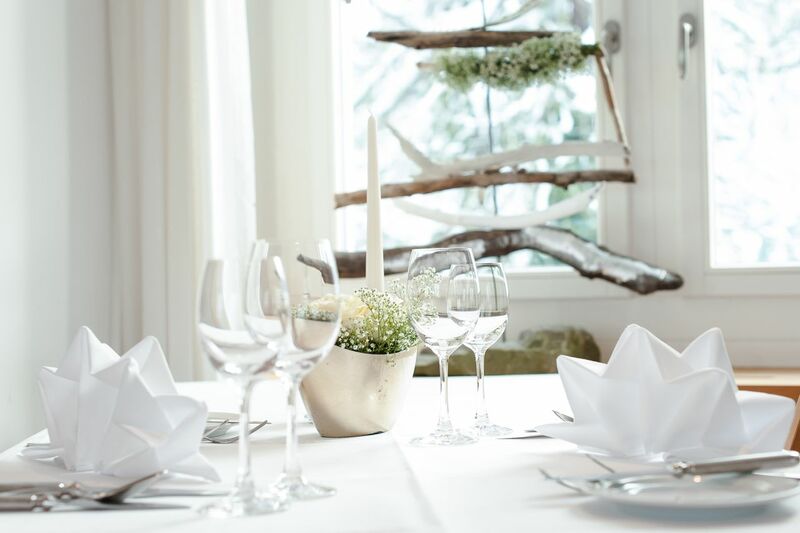 Located only 20 minutes away from St. Gallen, the organic Schlosshotel Wartegg welcomes you in idyllic surroundings. In the midst of meadows and trees, situated directly on the Lake of Constance you feel immediately a natural relaxation on site. Use this ambience for the realization of unique event ideas! Besides, limits are hardly set to your visions. We gladly adapt to each of your wishes with pleasure and in most flexible manner. Whether it is a birthday party, a family meeting, a jubilee or an atmospheric Christmas dinner - in our rooms in which the seating can be arranged individually, we offer an unforgettable setting for every group size. Of course, there are sufficient parking spaces on different areas of the location. You carry out business occasions like conferences, seminars or meetings on quite a high standard in our house and that is one of the reasons why we are on the top ten list published by Spektramedia! The special atmosphere inside the castle is due to our location and we underline it with state-of-the-art furnished rooms that are flooded with light. It is also for this reason that the interior equipment consists of natural materials. Warm light ensures coziness and our seminar technology low in radiation opens the doors to any purpose. If required, we can order further equipment. All together we provide three seminar rooms for your business events. Number one offers 59 sqm for up to 24 people, while the second room can take 18 participants on 53 sqm. With its 29 sqm the third space is the smallest room and it is ideal for more intimate conversation rounds of 8 to 10 people. All rooms have Wi-Fi access. The seats can be arranged variably according to your choice. For larger parties, we offer our 111 sqm big lecture hall and concert hall that is suited for up to 140 guests. With pleasure, you can spend your breaks in the restful atmosphere of our castle park. Moreover, we supply various supporting programs to entertain you. Become an archer, proceed on our GPS castle treasure search or hit a few balls at the hotel golf facilities. In addition, you can also organize a campfire in the fire ring together with the whole staff. Enjoy a tasty wine or prosecco as well as home-made lemonade. Whether we grill your tidbits on the BBQ or you rely on your own skills - we will leave it up to you. For overnight accommodation, you may expect 25 single and double rooms with high-quality furnishing and a unique view up to the Lake of Constance. 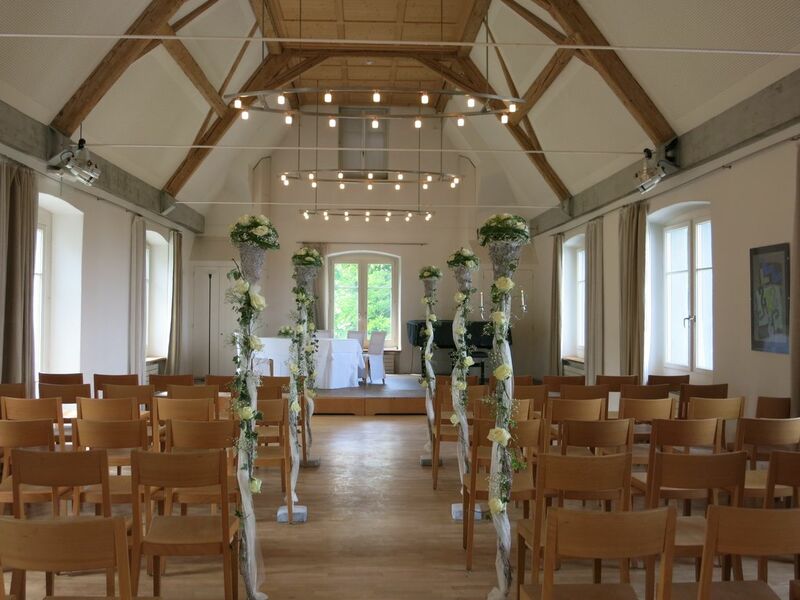 The organic hotel Schloss Wartegg with its romantic location and its exceptionally beautiful halls is perfectly suited for the realization of your dream wedding. According to weather and arrangement, in the castle or under the open sky with south terrace and forecourt, we decorate different places at which you can gather for the reception or the aperitif and prepare yourselves for the unique celebration. The banquet hall is suited for 77 guests on 103 sqm without dance floor and 64 guests, if we provide a dance floor. On this occasion 140 guests can be invited to the concert hall. If requested, you can rent our grand or the piano and supply your individual music. Distributed over several rooms and in loose seat order and atmosphere, you can celebrate your happiest day with 150 people. If you want to use the complete castle exclusively, this can also be arranged at a flat rate. Moreover, we make available a 4 x 8 m tent for the undeveloped outskirt area and extend it with the help of an external partner, if requested. Our high-class culinary team provides excellent delights. The catering of the castle is recommended by “Gault Millau” as well as by “Michelin” - you will taste it! Our name may suggest it and we confirm it with pleasure: For us, “organic” is not simply a certificate as a smart appendix, we are definitely convinced of this principle. Our ingredients come from nature, from seasonal and garden-fresh cultivation. We place the greatest value on a careful preparation which preserves the original qualities. On your wedding, we serve one of our marvelous menus or a buffet, of course in vegetarian variations, if requested. Moreover, you may enjoy high-quality organic wines from our extensive list. Your wedding cake can be made by us or by an external baker. We gladly support you with the suitable floral decoration and other decoration after previous agreement.